Google has unveiled a new commercial for Chromebooks. And this one serves the dual purpose of roasting Windows and macOS while simultaneously talking up the benefits of Chrome OS The Fundamental Advantages Of Using A Chromebook The Fundamental Advantages Of Using A Chromebook Chromebooks are highly divisive and a consensus about the merits of Google's offering is a long way from materialising. Here are the key advantages of using a Chromebook when compared to Windows and Macs. Read More and the machines it powers. Microsoft and Apple can’t be happy about this. From the moment it arrived on the scene, Chrome OS has battled to be taken seriously. It has felt like Windows and macOS are the big boys (with Linux the neverending trier), while Chrome OS is a junior operating system that doesn’t deserve to be taken seriously. In the space of a minute, Google not only puts the boot into Windows and Mac, but also highlights the strengths of Chrome OS. Owning a Chromebook used to be a frustrating affair, but the devices are now capable of competing with its more popular rivals. Interestingly, there’s no mention of Windows 10. 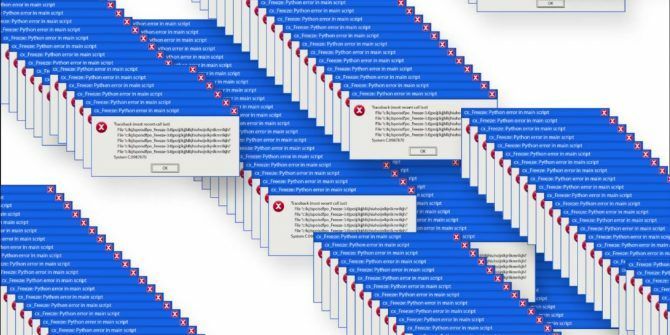 Instead, the error messages displayed in the ad are those which appear in older versions of Windows, up to and including Windows 8. Which suggests Microsoft is doing something right with Windows 10. The timing of this ad is intentional, and designed to persuade even more parents that Windows and macOS are the past, while Chrome OS is the future. Chromebooks are popular amongst students, and this represents Google doubling down on its core market. Whether you’re already a fan of Chrome OS or are newly interested in buying a Chromebook, our previous coverage has you covered. Here are some tips for first-time Chromebook users 20 Tips Every First-Time Chromebook User Should Know 20 Tips Every First-Time Chromebook User Should Know Chromebooks are great, but come with a learning curve, and take some getting used to if you've switched from macOS or Windows. Here are several Chromebook tips and tricks to speed up that process. Read More and the things you need to consider before buying a Chromebook 7 Things to Consider Before Buying a Chromebook 7 Things to Consider Before Buying a Chromebook How do you know if a Chromebook is right for you? In this article, I'm going to explain seven things you need to consider before making a purchase. Read More . I saw the photoshop logo, will we have good news on linux? Chrome OS is still an emasculated junior operating system. The only reason it is even in the conversation is because everybody is gaga over Google products. Chrome OS is an attempt by Google to lock users into a walled Google prison. Replaced my Mac Book Pro with a Pixel Book and could not be happier. Google has enabled GNU/Linux in the Pixel Books which is ideal. OS X is Unix so close to the cloud but NOT the same. Now I can use the exact same containers I use in the cloud on my laptop. Google shared 50% growth YoY in Chromebooks and would expect that hyper growth to continue. Google just has a far better solution than the alternatives. No. OS X is BSD which is based on Unix, just as Linux is. And, whether you know it or not, Chrome OS is mostly Linux. "Google shared 50% growth YoY in Chromebooks"
Big, Fat, Hairy deal! When you go from selling 10 units to selling 15 units, you have 50% YoY growth but the total sales are nothing to write home about.